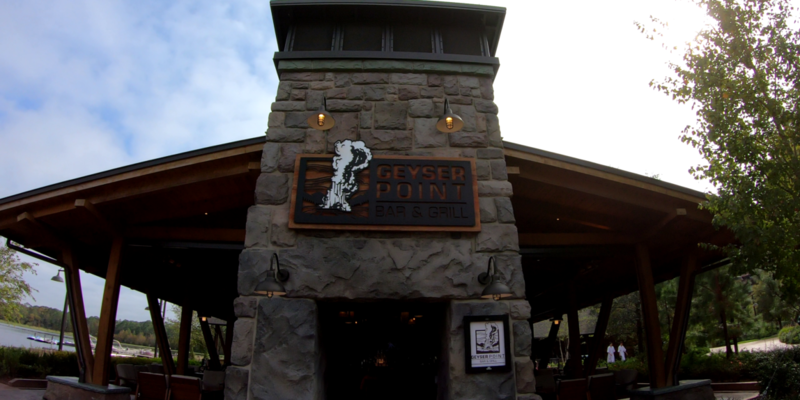 Geyser Point Bar and Grill is located on the edge of the very picturesque Bay Lake. This is a wonderful place to grab a drink and Relax. Geyser Point Bar and Grill serves two purposes. It is a quick service location to take some of the high volume away from Roaring Fork and a well themed pool bar. Though there is a sit down option here (which almost always has a wait) there is a quick service window you can walk up to. This is where you would go if you were hanging out at the pool and wanted to grab a quick bite to eat. There is also a bar area where you can seat yourself. There always seems to be a line at Geyser Point Bar and Grill so keep that in mind if you are in a bit of a rush. 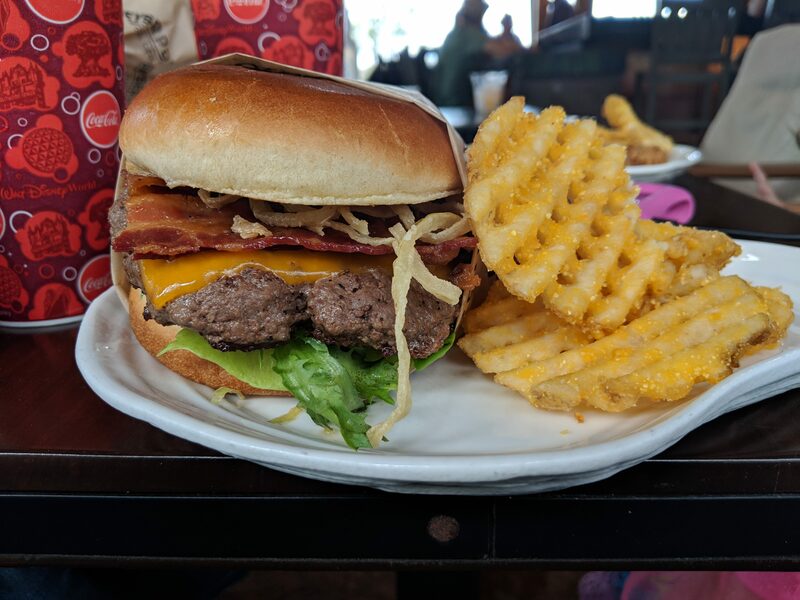 If you were planning on spending the day at one of the amazing pools at Wilderness Lodge Resort we would definitely recommend skipping Roaring Fork and just grabbing take out from the quick service window. Seating here can be limited. The restaurant is configured in such a ways that it’s easy to be seated next to another group. Sitting next to someone isn’t a big deal but it’s a little odd when you are sitting at a small bar table and there is maybe a foot between you and the other group. Not only is it hard to carry on a conversation but you feel like an evesdropper! I think Disney primarily counted on this location being a bar but the food aspect was much more popular than was ever anticipated. It is far more restaurant than bar these days. We got here around 11:30 on a Saturday and had to wait half an hour to be seated. Not a big deal on the weekend. One thing to note is that there is not a podium here to check in. A cast member was kind of breezing back and forth between the seating and the entrance to the bar. We had to ask him where to put our name in because other guests were standing around looking confused. This is the oddest layout we’ve ever seen at a Disney restaurant. Again, we think Disney was gearing this more towards being a bar but it ended up being a more popular food destination. After we were seated we ordered and our food came out about half an hour later. All in all I would say that there a few kinks here that still need to be hammered out. For starters there should be a podium to put your name in. There should also maybe be some benches for people to wait at. Everyone just kind of stood in a crowd waiting to be seated and really causing some congestion in that area. The service here is mixed. Orders were taken promptly and we got the food quickly but it was hard to flag our server down to pay. When we ate here the menu was very hit or miss. Adolfo got the Bison Cheeseburger and I got the Crab cake Sandwich. There wasn’t a kids menu when we were here but they did have chicken nuggets and waffle fries. The Bison Cheeseburger was a hit! Bison is very lean and you really need to bring in other flavors to keep the burger from being too boring. This one had bacon, Tillamook cheddar cheese, and a Marionberry Barbecue Sauce with garlic aioli. Adolfo didn’t care too much for the marionberry in the bbq sauce and wish they had picked something with a more robust flavor profile over something sweet. 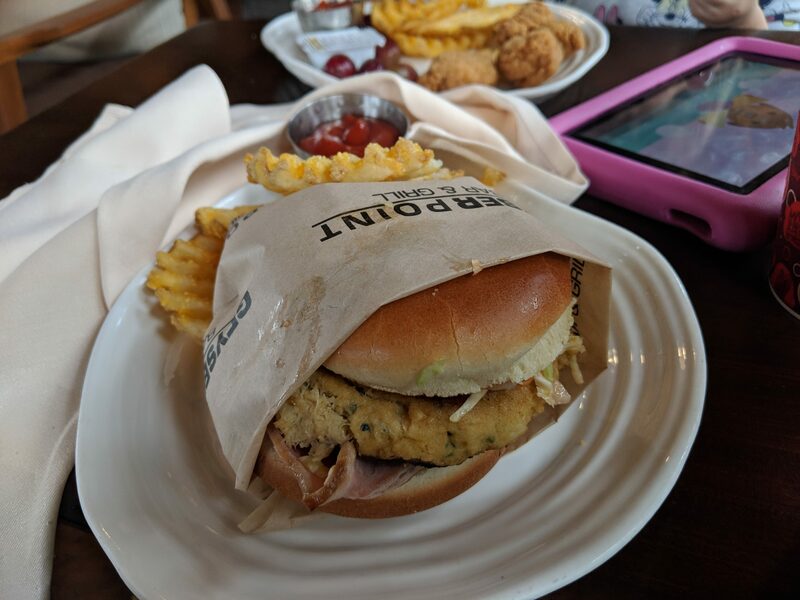 The Lump Crab Cake Sandwich…. This was horrible. I cant put it nicely. This is one of the worst things we’ve had on Walt Disney World Property. For starters the Crab Cake had nothing lump about it, it was a mushy mess. The put a very small amount of coleslaw on it and quite honestly that could have been the sandwiches saving grace. The Coleslaw was spicy so they use it sparingly. The crunch it could have brought to the sandwich might have saved it. All the sandwiches are served with battered criss- cut fries. These are delicious and we wished they would double the portion. Would We Eat at Geyser Point Bar and Grill again? Honestly, we might skip the food here in the future and just order some drinks. The view here is amazing and for that alone we think it is worth the trip if you are already staying at Wilderness Lodge Resort. Although they do have a new lounge menu that looks amazing so we might try that instead of the lunch menu in the future.